American Century Investments and Lake Tahoe Visitors Authority presented grants to area nonprofits on Nov. 9. More than 30 local nonprofits received some good news earlier this month. A total of $51,000 — raised during the annual American Century Championship — were distributed among the nonprofits. The announcement and check presentations were made at the Lake Tahoe Visitors Authority (LTVA) Nov. 9 board meeting, according to a press release from LTVA. The tournament provided an additional $49,000 through on-site volunteer organizations that worked at the event, including Soroptimist International of South Lake Tahoe, South Lake Tahoe Vikings Booster Club, Douglas County Search and Rescue, and the Gene Upshaw Memorial Scholarship. To be considered, local organizations were required to meet 501(c)3 certified nonprofit guidelines, provide an outline of their mission and describe how the donation would be used and indicate its impact in the community, according to LTVA. 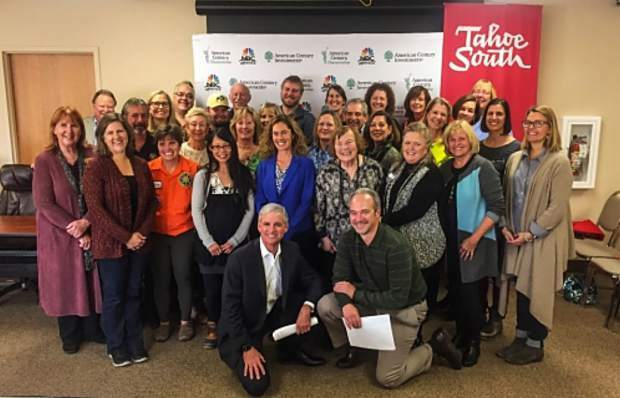 From 2009, donations exceeding $800,000 have been distributed to more than 80 local nonprofits to assist more than 10,500 individuals, according to Tahoe South. Since its inception in 1990, the tournament has donated more than $4.5 million to local and national nonprofits. The 29th annual American Century Championship is slated for July 10-15. Visit http://www.AmericanCenturyChampionship.com or http://www.TahoeSouth.com for more information.